The Char FCM 2C remains the only super heavy tank produced in series and used operationally in any army, and the heaviest tank ever built until the arrival of the German Tiger II in 1944. Although designed to take part in the Hindenburg line assault of 1919, the second FCM project entered service after the First World War and never fired a shot in anger – only in front of the cameras. When it was first thought by General Estienne (the French father of tanks), the breakthrough tank was at the complete opposite side of the spectrum compared to the nimble Renault FT. Since the latter was designed to overwhelm the enemy by sheer numbers, the first was to destroy any fortification in sight. By the summer of 1916, Général Mourret, the Subsecretary of Artillery, although opposed to the FT, verbally granted Forges & Chantiers de la Méditerranée, a shipyard, the permission to study the construction of heavy tanks, under the “char d’assaut de grand modèle” denomination (literally “great model assault tank”). At that time, no contract was officially signed or order placed for heavy tanks, but it was commonplace for industrialists to actively lobby for orders, even unofficial, as developments were fully paid by the state. One possible explanation was Mourret knew of British heavy tank development under a naval committee and wanted a French shipyard to cope with these technical advances. Nevertheless, FCM, although paid, never started even basic studies for the model. However, by September 1916, when the British Mk.Is were revealed in action on the Somme, this triggered public inquiry about the state of French advances in tank design. General Mourret soon found that FCM had neglected it and prompted a personal control over the project, plus an invitation to Renault. The latter had indeed worked on a heavy mobile mortar project. On October, 20, a prototype was ordered. The minister of armament, Albert Thomas, also pressed to develop a better design than the British models. First specifications included 40-ton weight, heavy firepower, immunity against light artillery and the capacity to cross the largest trenches. Under Renault’s Rodolphe Ernst-Metzmaier design lead, a mock-up was quickly made and presented on 13 th of January, 1917 to the Subsecretary of State of Inventions Jules-Louis Breton, receiving an enthusiastic reception. It was also presented to the Consultative Committee of the Assault Artillery. It was to be armed with a 105 mm (4.13 in) howitzer in a fully revolving turret, full-length tracks, and 38 mm (1.5 in) of frontal armor. Since transmission and steering proved an issue, two prototypes were ordered, with an electrical and a hydraulic transmission. However, there was a fight of influence between General Mourret, opposed to Estienne’s FT project, and Estienne himself, fearing that the draining of resource towards these “land battleships” would cripple the meager French industrial capabilities. He referred to General Joffre himself, trying to have the project canceled. Later on, he was replaced by General Nivelle, which also emitted strong doubts about the heavy tank project, and favored instead the Schneider CA. Meanwhile, Mourret had then three prototypes ordered in February 1917. However, since the first action of the Schneider CA was a disaster, the hot-tempered minister of production canceled all tank projects. This prompted Estienne and General Mourret to ally themselves and eventually got Thomas to retract his decision. By June 1917, however, FCM informed that the first prototype was far from completion, lacking parts from Renault Factory. The latter was summoned in August by the new head of CCAS leading the project, General Moritz. On the 18th of October, he announced that first trials could begin in November. 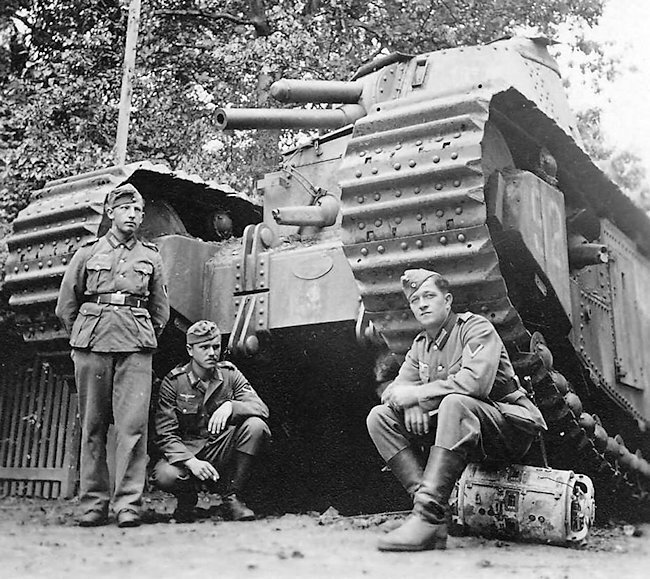 The FCM 1A was the first prototype delivered, featuring impressive dimensions, armament, and protection. Both the hull and turret featured 35 mm (1.38 in) armor thickness, raising the total weight to 41 tons. There were four sections in the exceptionally lengthy (8.35 m/27.4 ft), but narrow hull, but without bulkheads. These were the driver, fighting, ammunition and engine compartments. The main turret was large enough for two men, and the crew, by December 1917, was fixed to six men. The original Canon de 105 Court Schneider was shortened to fit in the sloped turret and could fire HE shells at a muzzle velocity of 240 m/s (787 ft/s), with 122 rounds being carried. There was a set of two Renault 220 HP twelve cylinder engines, with a mechanical transmission. The drive sprockets were at the rear, and the suspension counted numerous four wheel bogies with alternating external and internal flanges, suspended by leaf springs. Ground pressure was reduced by the 60 cm (1.96 ft) wide tracks. Thanks to the overhanging tracks, it was found capable of crossing 3.5 m (11.5 ft) and wider trenches. The interior was roomy, in contrast to other models, the crew being able to communicate and move inside easily. When General Pétain replaced Nivelle and placed Estienne as the head of the commission, there were questions once again on the project. Estienne insisted the next heavier prototype FCM 2C was built instead, and later Pétain ordered 300 of them to be delivered in March 1919. Then both added further requirements, plaguing the project with further delays. At the end the hostilities, the project was canceled, and then reopened in 1920, mostly for political reasons. 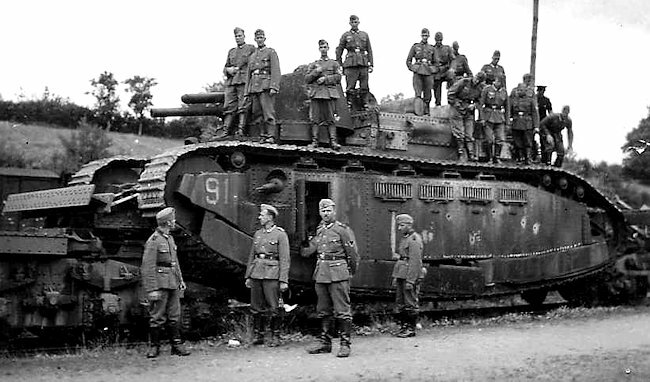 In the USA and Great Britain, the new Mark VIII had been indeed accepted in service, but France had not yet produced any heavy tanks and there was now industrial over-capacity. A final order for ten FCM 2Cs was eventually placed in April 1919. The photograph below is positive proof that the Army High Command in 1939 France (and Britain) believed that a future war would be fought strictly on the lines of WW1 trench warfare. Tanks needed to be long and able to cross enemy tranches to punch through their defensive lines to make a breakthrough. 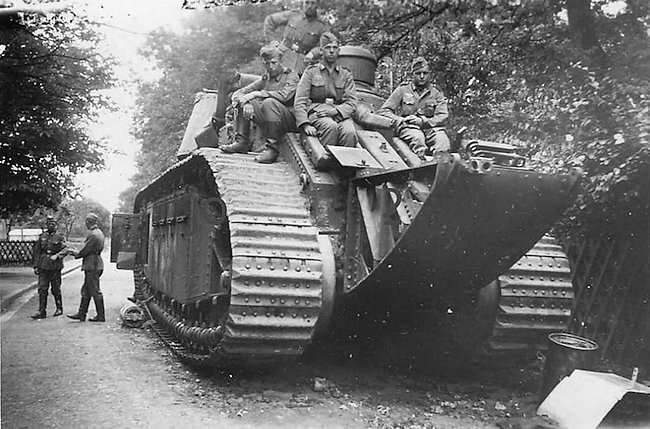 The French also built ramps on the top of their R35 tank to carry bundles of wood fascines to enable the tank to cross ditches. The Renault FT tank was fitted with a rear skid tail. 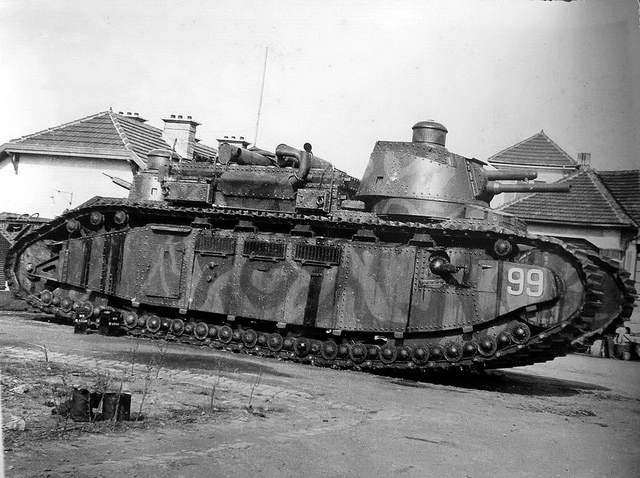 The FCM 2C was the largest of all tanks to have been fitted with a tail skid. The FCM 2C was even heavier, weighing 69 tons loaded, the armor counting much of the extra weight, with a 45 mm (1.77 in) thick sloped nose and turret, and 22 mm (0.87 in) on the sides, but also the even longer hull. A rear crossing tail could be fitted at the rear for extra mobility in super-sized trenches, culminating with a 12 m (39.3 ft) long vehicle. The turret was enlarged and wide enough for three men, and now housed a quick-firing, high velocity 75 mm (2.95 in) gun. A rear turret was added with a single machine-gun, both topped by stroboscopic cupolas. Two other machine-guns were placed in forward-firing barbettes, the fourth being coaxial in the main turret. With such weight, the choice of the adequate engines now fell on the recently received German V12 Maybach, previously used on Zeppelins, which had the required power. Each propelled a single track via an electrical transmission, and top speed now reached 15 km/h (9.32 mph). They were fed by no less than seven fuel tanks, placed around the engines. The mechanics could access the compartment, and work around the engine from inside, like in a submarine. The suspension was reinforced, counting now 39 small interleaved road wheels on each side. The crew now comprised twelve men, including the commander, driver, gunner, loader, radio, mechanic, his assistant, an electrician, and four machine-gunners. By 1921, Jammy and Savatier of the FCM building team finished the prototype and the nine serial vehicles almost simultaneously, and all were delivered and later modified in 1923 after trials. The only known variant was Champagne testing briefly in 1926 a 155 mm (6.1 in) howitzer turret. This was known as the FCM 2C bis. 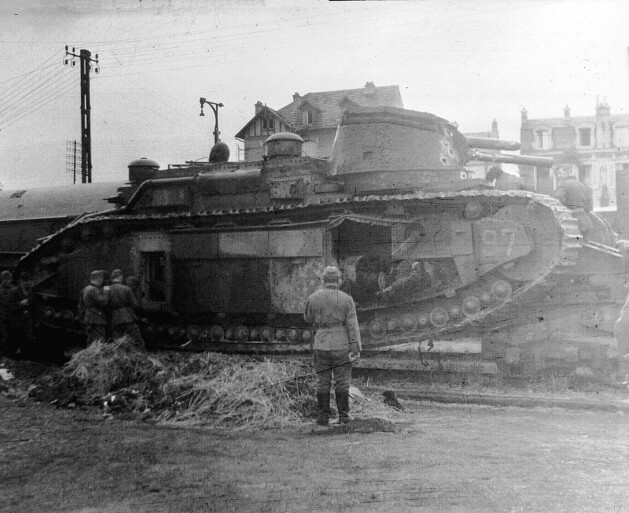 In 1921, France possessed the very first and only operational super-heavy tanks in the world. For prestige reasons, and perhaps as a French naval tradition about capital ships, they would be christened after French regions, namely Poitou, Provence, Picardie, Alsace, Bretagne, Touraine, Anjou, Normandie, Berry, and Champagne. They formed parts of various units, reorganized until the organic strength declined to only three units, only shown for propaganda reasons. By 1935, their fighting value had dwindled mainly because of their low speed and high profile, more vulnerable to modern AT guns. By 1939, they were all reactivated and officially formed the 51st Battallion de Chars de Combat, widely shown in movies as morale boosters. These helped the public and even the press to imagine invincible super-tanks with dimensions and weight fogged by utter fantasy. 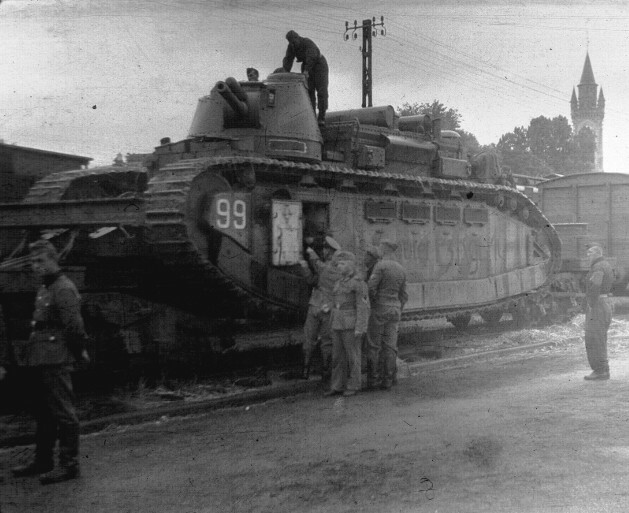 This captured FCM-2C tank is No 92 Pichardie which broke down in Pienne due to an electrical fault on 12th June 1940. It was destroyed by its crew the next day. The soldier on the right is sitting on one of the tanks drive motors. In June 1940, instead of confronting head-on the Panzer divisions as the situation was hopeless, the French command ordered all ten to be shipped by rail to the south of France. FCM 2C No.94 Bretagne, No.95 Touraine and No.96 Anjou were out of service during Fall Gelb (Case Yellow) invasion of France and Fall Rot (Case Red) the plan for the second phase of the conquest of France. 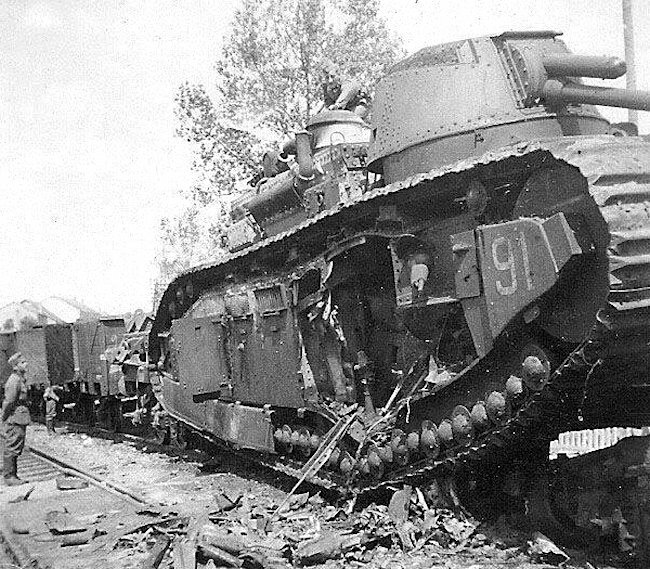 FCM 2C No.91 Provence Tank destroyed whilst on the back of a railway flatback wagon. Of the others five No.91,93 94 97 and 98 were destroyed on their rail wagons on 15th June 1940. The railway was blocked by a burning fuel train and it was decided to scuttle them by detonating explosive charges rather than allow them to be captured. 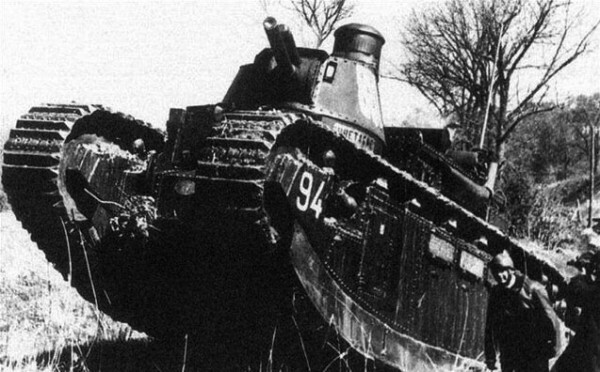 Later on, German propaganda claimed -and showed in newsreels- that these giant tanks succumbed to a German air attack. FCM 2C No.99 Champagne was captured as its scuttling charge failed to detonate properly. It was apparently captured in good condition and sent to Berlin as a war trophy. It the survived WW2 and was taken away by the Soviets but has never been seen again -so most likely scrapped. This is a photo of the other side of FCM 2C No.91 Provence Tank showing the damaged caused by the crew. FCM 2C Poitou in 1930, the last of the series. Its like the French TOG II* but this was produced (only 9 more than the TOG II*). How did this perform on battle? is there a reason why all of the crews destroyed these before they got to combat? They were not destroyed by their crews. They were on transit to the front lines when a German infantry platoon spotted them and they called in a stuka strike on them and all the char 2Cs were destroyed while in transit. Was the Stuka even in service during this time? The Stuka was indeed in service during the battle of France in 1940 and played a major role in providing accurate close air support to the German forces. The vehicles were not destroyed by Stuka dive bombers, as the article clearly outlines they were destroyed by their crews after the rail line was blocked by a previous air attack. After the wreckage was captured the Germans bombed the wrecks with Stuka bombers in a staged attack for propaganda news reels. I read a short story about how a single Char 2C managed to be salvaged and put into some fighting in The early parts of WW2. I got this info from an extremely reliable book I used to have. It showed 3 pics of the tank with one being the 2C with noticeable damage from what looks like 37 and possibly even 47mm guns. Is it possible that one was at least retrieved to fight for a short time? The pic is extremely clean and shows no signs of photoshop so I have to take it for its intent. Is ARL 44 exist or it’s only France’s mere WW2 Project?? The AMX 40 was a real project, but only remained on paper and was never built.